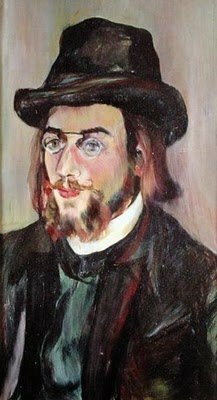 Boston Globe music critic Jeremy Eichler’s recent wide-ranging article about the sesquicentennial of Erik Satie (1866-1925) reminded that I have long wanted to put in my two cents about this beloved eccentric of the belle époque. I haven’t yet seen the new book by Caroline Potter that Eichler mentions, but at one time I was considered at least a Satie guru, having played and performed his music since age 15, given colloquia in college and graduate school, and in the 1960s having tried to put together a recording project of his piano music. Nobody else was interested in Satie back then except John Cage, able propagandist for musical Dada, for which Satie could have been considered a pioneer even before the movement in literature and the visual arts got going. It took the popularizing of Gymnopédie no. 1 by Blood, Sweat and Tears, in the late 1960s, to launch Satie into worldwide recognition. “He was certainly the oddest person I have ever known, but the most rare and consistently witty person, too,” Stravinsky wrote in 1959. Satie’s peculiarities came in part from an assorted childhood and inconsistent musical training, but can best be ascribed to a lifelong extreme self-consciousness, one that he himself realized would conceal, even excuse, his technical limitations under a mask of wit and bizarrerie, while forward-looking musicians would acknowledge the originality of his accomplishment. Eric Salzman called Satie a composer of “a great deal of genius if little talent,” which hits it about right. Debussy was the first to recognize what Satie had to offer, and learned much from it; both Ravel and Stravinsky, half a generation later, acknowledged their debt; and the Groupe des Six, fortified by the antics of Cocteau and the aesthetic convulsions accompanying World War I, helped to make Satie famous at the end of his career. Satie’s Pièces froides for piano—most of his works are for piano solo—date from about the same time. These “cold pieces” too are rhythmically very regular and highly repetitive in pattern, but with a fascinating chordal harmony that wanders freely from key to key. An early sketch, now at the Library of Congress, reveals that Satie based one of them on the Scottish folksong “The Keel Row,” more than a decade before Debussy used the same melody in his Gigues (in all likelihood neither composer was aware of the other’s appropriation; Satie might have learned the tune from his Scottish grandmother). One of Satie’s best-known works, with a good deal of lovely music, is the Trois morceaux en forme de poire for piano four hands, which was supposed to be Satie’s rejoinder to Debussy’s comment that his friend’s music lacked form; poire means “pear,” of course, but also “dolt.” These are essentially slung together helter-skelter from a Gnossienne left over from the Fils des étoiles music of 1891, from sketches for the two sets of Pièces froides, and some of Satie’s music-hall style of the time; a further joke is that there are seven pieces, not just three. The complete Morceaux en forme de poire were probably complete by about 1903, right around the time that Satie, in his late 30s, decided to go back to school. Debussy advised against this move (“A notre âge on ne change plus de peau,” he said), but Satie enrolled in the Schola Cantorum (the most Catholic of the conservatories then) to study with Roussel and d’Indy; he graduated “très bien” in 1908. For the next decade, Satie’s style is both absurdist and contrapuntally learned. (I don’t include his cabaret songs and waltzes, which brought him income meager but sufficient to live on in one of the poorest districts of Paris.) These reach a climax in the years before WWI with piano pieces such as the Embryons desséchés with their famous glosses (“like a nightingale with a toothache”), comically extended cadences, and burlesque of Chopin’s Funeral March (“cited from the celebrated Mazurka by SCHUBERT”), and the Sports et divertissements composed to accompany drawings in a deluxe edition by Charles Martin with Satie’s own beautiful calligraphy. In 1913, the same year as Le sacre du printemps, Satie also wrote a Dadaistic scenario with music called Le piège de Méduse, which was published in an engraved edition with woodcuts by Georges Braque. And he continued to write short comic pieces for children to play; the best is the Sonatine bureaucratique (1917), an unabashed parody of Clementi’s immortal Sonatina op. 36 no. 1. Stravinsky wrote that Satie was “always very poor, poor by conviction, I think.” During WWI this conviction brought out a different side of Satie; at least one source has him organizing activities for the children of Arceuil, for which the community gave him a dinner in his honor. It was at this time that he was “discovered” by Jean Cocteau, who worked up a ballet scenario, with décors and costumes by Picasso, for Diaghilev’s reduced but still vibrant ballet company. The result was Parade, which received a riotous premiere in 1917. The music included a chorale and nonfugal fugue deriving from his Schola Cantorum training, a variety of short dance episodes (with a “Rag-time du paquebot américain” which lifted a forgotten melody from Irving Berlin), and, at Cocteau’s suggestion, an assortment of comic noisemakers (typewriter, pistol, lottery wheel, sirens, a “bouteillophone”, and something called “sonorous puddles”). At the same time Satie wrote what some consider his masterpiece, Socrate, a so-called “symphonic drama” after Plato, text in French, for three sopranos and chamber orchestra. “The trouble with Socrate is that it is metrically boring,” wrote Stravinsky, who attended the premiere. “Who can stand that much regularity? All the same, the music of Socrates’ death is touching and dignifying in a unique way.” That much regularity, indeed, has become a hallmark of the minimalist infestation that has corroded our art ever since the 1960s, as a logical result of rock’n’roll and Hovhaness’s mantras as much as anything of Satie’s—although he did compose Véxations with instructions to repeat it 840 times (in the broadcast premiere of that work I was pianist no. 2), and another piece called Carrelage phonique (sonic tilework), four bars repeated as often as needed. 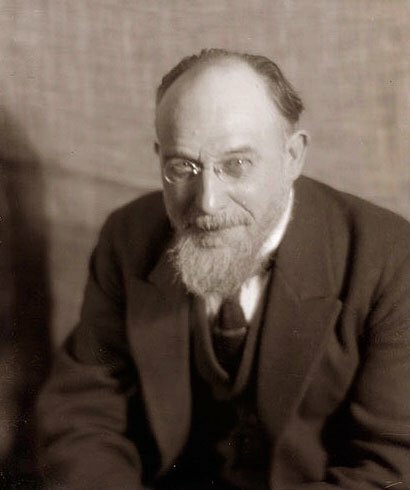 The populist style increasingly dominated Satie’s last compositions, including La belle excentrique (1920), which included a “Marche franco-lunaire”; a ballet called Mercure (“poses plastiques” with décors and costumes by Picasso, 1924); and, for the Ballets Suédois, his last work, Relâche (“ballet instantanéiste” in two tableaux, 1925, scenario by Francis Picabia, who appears with Satie himself in a cinematic Entr’acte by René Clair). These often rowdy works, along with Parade, endeared Satie to the group of emerging postwar Esprit nouveau composers who reacted not only against Austro-German hegemony in music but against Impressionism in all the arts. Milhaud wrote about Satie with great affection in Notes Without Music, and he especially can be credited with keeping the best of Satie’s art in the public consciousness as the 20th century moved from revolution to catastrophe and all over again. The public who in the 1970s accepted Satie’s musical shrugs as a kind of nihilism rather than minimalism are now rediscovering the real subtleties of his art—limited, it goes without saying, but with a degree of perfection of thought, and an occasional beauty of discovery that even Satie himself probably did not realize.